A favorite anti-THR lie is to claim there is no evidence of something when there is actually a lot of very compelling evidence. If pushed, such liars generally try to weasel out of their claim by saying “well, I meant no evidence of one particular type.” Sometimes they will try to claim that only one particular type of evidence is informative (and they might even believe that — but that just means they have no business claiming to understand science, and so are lying about that). For example: “we cannot be sure that smoking causes cancer because there are no randomized trials that show that.” Yes, we are saying that the anti-THR liars of 2012 are borrowing the tactic used by cigarette companies in 1970. Hahn has produced and distributed this poster without admitting authorship (personally or in the name of her Center — notice that she made up a new name for her organization to try to hide the connection), making it pretty clear that she knows these lies are so bald-faced that even she does not want to be associated with them. However, she did prominently post it at her Centers website, which makes the subterfuge rather obvious. Today we will address just the “There’s no evidence of this.” (We will not try to figure out why someone would use a contraction for “there is” in a written document.) We will continue with the other lies from that poster tomorrow. Anyone at all familiar with this topic knows that there is loads of evidence that e-cigarettes cause people to quit smoking. There are hundreds of thousands of former smokers who now use e-cigarettes instead. That alone would lead any honest person who understood scientific reasoning to conclude that they help some people quit. There is simply no possible way that every one of those switchers, had they not discovered e-cigarettes, would have just quit smoking at the same time they switched; it would be utterly absurd to suggest that. Moreover, there are countless testimonies from such people who declare that they are quite sure they would not have quit — already, and perhaps ever — had they not found e-cigarettes. The presumed response to that (if anti-THR people ever dared stand up and try to defend their claims instead of hiding behind their propaganda posters and talking only to each other) would be, “but that information is not from organized scientific studies, and they are especially not from randomized trials, so it does not ‘count’!” It is important that we do not let the pseudo-scientists that make such claims and thereby distract us from the scientific intuition that we all acquire as children. We all know that most knowledge does not come from organized studies of the type that are used to, say, figure out whether one particular chemotherapy agent works better than another. That type of study accounts for only a tiny fraction of all the scientific knowledge we have. This is especially true for mass social phenomenon, like the decisions of free-living people to quit smoking, which are pretty much impossible to study in that way. It turns out that even the “but there are no formal studies” claim is a factual falsehood in this case. 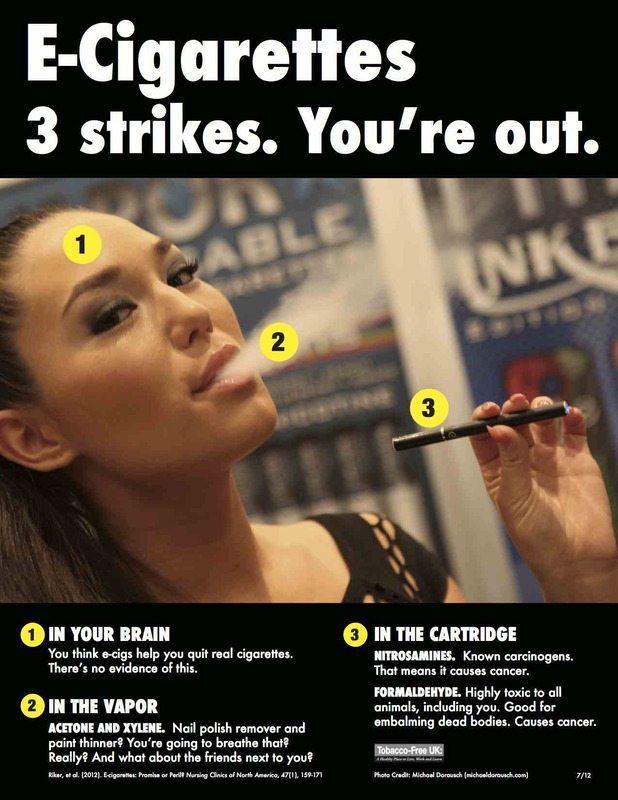 There are a few lab studies in which smokers were given e-cigarettes. But we should not make the mistake — that the liars and innumerate non-scientists might make and then cause others to make — of thinking that these small, highly artificial observations are more informative than the observation of what people are actually doing. It is reassuring that these studies come to the same conclusion we derive from observing the population. But the best scientific evidence you can ever have that something happens in the real world is observation of it happening, hundreds of thousands of times, in the real world. Many people believe that the use of snuff and other forms of smokeless tobacco is safer than smoking. However, potent human carcinogens (N-nitrosamines) are also present in high concentrations in smokeless tobacco. These carcinogens have been clearly linked to cancers of the lung, esophagus, liver, pancreas, bladder, cervix, nasal and oral cavities. There simply is no safe way to use tobacco products. Since the goal here is to address only one lie per day, consider just the first sentence, as juxtaposed against the rest (the whole paragraph is included because the sin here is of omission). This is one of the original classic anti-THR lies which I documented as being common a decade ago in my 2004 study, “You might as well smoke”. Notice the game, a simple method of lying via the use of a non sequitur, without actually making the false statement that is being communicated. The message they are intentionally sending, and that most people will read, is “many people believe…, however that is not true”. But anyone with any knowledge at all knows that this statement about what people “believe” (which is used as a term of ridicule in this case) is true beyond any hint of doubt, so they avoid actually saying “but that is not true”. Instead they make some claims about lack of perfect safety (which are themselves lies, but those are a topic for another day; they could have stuck to honest statements and still used this tactic, though, so that is not relevant today). Almost every reader will interpret these statements as meaning that the “belief” in the topic sentence is false, especially with the “however”. If they had actually said “but this belief is false”, then we might conclude that they were clueless about the science. The fact that they avoided that false statement is what clearly shows that they were lying — intentionally communicating something they know to be false, even without making the literally false statement. Ironically, that first claim, that most people believe, is a literally false statement for many populations, but that unimportant technical falsehood is not actually one of the several anti-THR lies in the paragraph.